Last Thursday evening, we headed up the pass to the Skirball Center for an evening of Sufi music from Pakistan and Turkey performed by the Yuval Ron Ensemble. The music was fantastic (guest singer Najwa Gibran's pure-and-highly-trained voice was a auditory vision) and the setting was a really pleasant surprise. I hadn't realized how nice the Skirball is. We watched the concert in a modern, outdoor space that felt warm and inviting as opposed to cold and Lincoln Centeresque. 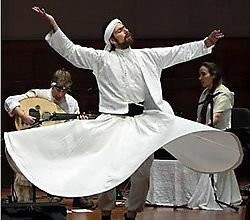 Our favorite part of the concert was Dervish Aziz (pictured). We both had never actually seen a whirling dervish — and Aziz's performance turned out to be stupefying and moving by equal measures. If you've never seen a whirling dervish in action, this is definitely something to add to your to-do list. I'd also recommend the Ron Ensemble to any and all local music lovers. I believe the group's next performance is Nov. 2 in Brentwood.